There are not a lot of high quality convertible strollers on the market, so I was very excited to see a new Nuna Demi Grow model. This models converts from the single into a double tandem mode with an addition of the second seat. Since Demi Grow looks very similar to the popular UPPAbaby Vista and has a lot of similar features so I can’t help but compare them throughout my review. And this is going to be a long review… Sorry guys, but there are a lot of features to cover. The Demi Grow is a very chic and modern stroller that grows with your family. It can accommodate siblings close in age or twins. It can handle two full size seats, two bassinets, or two car seats. Both toddler seats are the same and have a weight limit of 50 lbs. The seat has huge canopy plus a sunvisor and pull out drape. The one hand recline goes to a flat position suitable for a newborn. I like the zip off seat liner that exposes a mesh seat underneath. Great for hot summer days. There is also an adjustable leg rest, swing-away bumper bar, adjustable handle bar, easy fold, auto lock, standing fold and huge basket. It rolls on foam filled wheels that together with all-wheel suspension provide a nice ride. The basket is huge and can fit your largest diaper bag. Now, let’s talk about drawbacks. This buggy is kind of heavy weighing 28.5 lbs in a single mode. It also has a pretty bulky fold and you have to remove the second seat before folding it. The brake is not flip-flop-friendly which is surprising because all other Nuna models have it. But, the biggest downside is when you add the 2nd seat, you completely lose your basket space because the seat goes in the back. And what do you do with the diaper bag? Since you can’t really hang it off the handle bar because the second seat gets in the way, you will have to carry it. There is also less leg room which could be a problem for taller parents. The good news is that your footprint lengthwise stays the same. The high price of $799 does not include the bassinet, however it does come with two car seat adapters, rear wheel covers, and a rain cover. Overall, I think this is a very beautiful well made stroller which could grow with your family. It’s a very strong competition for the beloved UPPAbaby Vista. As of right now, I can’t tell you which one is better because they both have their pros and cons (detailed side-by-side comparison below). You can get Nuna Demi Grow in two colors for around $799. It comes with car seat adapters for Nuna PIPA™ and PIPA™ Lite infant car seats. It also works with Maxi-Cosi car seats. I wish it worked with other brands, but Nuna car seats are one of the best on the market. Their new PIPA Lite car seat weighs only 6 lbs! -Large canopy. Like all Nuna strollers Demi Grow has a great canopy. The expandable UPF 50+ canopy has two large panels with a pop-out sunvisor and a zipped in so called ‘dream drape’ (basically another sunvisor) that could be tucked away if not needed. It provides full sun protection. The dark mesh peekaboo window on top of the canopy insures good air circulations on the hottest summer day while still shielding your child from the sun. Like most luxury strollers it has a magnetic closure (no noisy Velcro) that won’t wake a sleeping baby. The double quilted stitch work covers inside of the canopy adding to the chic look. this is probably one of the BEST canopies on the market. -Adjustable handle bar. The telescoping leatherette handle bar has 3 different positions and goes from 38″ to 42″ from the ground. The cool thing about the handle bar is that it’s covered now with hand-sewn vegan leather instead of the rubber. You will need both hands to adjust the handle bar. Since this baby weighs close to 29 lbs, you can easily hang a heavy diaper bag off the handle bar. Unfortunately, there are no built-in hooks. -Reversible seat. The seat is 12″ wide with 20″ seat back and a measurement of 22″ from the back of the seat to the top of the canopy. The reversible seat has three-position one-hand lever recline including so called ‘true flat recline’ suitable for a newborn. It has the same recline positions in parent-facing and world-facing modes. Keep in mind, the seat always keeps it’s ‘v’ shaped so your child will be kind of in a sitting positioned even fully reclined. Of course I prefer to have a flat recline where only the back of the seat reclines so your child can fully stretch. But, most of the luxury reversible-seat strollers have that ‘v’ shape so there are not a lot of options. BTW, Vista also has the ‘v’ shaped seat. To reverse the seat, push two buttons on the sides, swing the seat around and pop it right back in. Now your child can face you. Super easy! The seat can accommodate a child from birth and up to 50 lbs. Of course I always recommend getting an infant insert before putting your newborn directly into the seat just to provide your baby with extra support. -Removable seat liner. One of the cool features that Demi Grow has and Vista doesn’t is the removable seat liner. You can just unzip the seat liner to expose a mesh seat. The mesh provides much better airflow keeping your child from overheating on a hot summer day. This is a great feature for parents who live in hot climates or travel to warm places. The mesh seat still offers plenty of back support. -5 point harness. This adjustable no-re-thread padded 5-point harness can be converted to 3 point harness as your child gets older. -Double mode. You can convert Demi Grow from single into a double mode by adding the second seat to the back of the frame. It can handle two bassinets, two toddler seats or two car seats. There are 23 different configurations. The second seat is identical to the main one and has all the same features including large canopy, recline, weight limit of 50 lbs, swing-away bumper bar, and adjustable leg rest. It goes right into the storage basket so your child will be kind of in a lounging position with his legs stretched out. This seat combination keeps the footprint of the stroller the same so it’s much easier to navigate small spaces. That’s a good news. The bad news is that you completely lose your basket storage and there is less leg room left. The loss of the leg room could be a problem for taller parents. Also, there is no place to put your diaper bag. You could hang it off the handle bar, but it will be in the way of the 2nd seat. I don’t think you will be able to recline the 2nd seat with the bag hanging. If you do, it will end up on your child’s head. That means you would have to carry it on your shoulder. -Adjustable leg rest. To adjust the leg rest you will only need one hand. While the adjustable leg rest is not really needed for an older child, it’s a great feature to have for a baby. -Parking brake. The single parking brake near the right wheels is very easy to uses, but is not flip-flop-friendly which is surprising, since Nuna Mixx2 has a flip-flop-friendly brake. -Huge basket. The basket is huge and very easy to access in a single mode. You can fit everything! Now, as I mentioned above, you lose it completely with the addition of the 2nd seat. For more storage I would recommend getting an universal stroller organizer. That way you can take not only your coffee cup, but also a LOT of stuff including keys, phone, water, wallet, snacks, diapers, toys, and more. The amount of stuff it can fit is unbelievable. -All-terrain wheels. It rolls on four foam-filled hard-rubber wheels with 10″ wheels in the back and 7″ wheels in the front. Foam-filled means you will never get a flat and don’t need the air-pump. The front wheels are swivel, but can be locked straight. These all-terrain wheels can handle a lot of different surfaces including mulch, grass, and uneven city streets. While these tires might not be air-filled like many true-all-terrain tires are, they are more than enough for everyday life. The maneuverability is great and you can easily steer it with one hand. -Wheel fenders. INCLUDED! Since in double mode the 2nd seat goes into the back of the stroller, your child could reach the rear wheels. So, Nuna included wheel fenders to protect your little one from getting hurt and dirty. -All-wheel suspension. It has all-wheel suspension system, but the rear wheels suspension can be adjusted. It adsorbs some of the bumps making the ride much smoother. -Easy fold. The fold is easy, but bulky. In double mode, you will need to remove the second seat before folding it. The first photo below is the fold without any seats and the second photo is with the main seat attached. You can tell it’s a big package. There is an automatic lock and if you position your handle bar the right way you can get a standing fold. There is a little plastic piece on the handle bar that protects leather from being scratched. Smart! Another nice feature is a handle in the back that you can use to carry Demi Grow when it’s folded. Now, UPPAbaby Vista can be folded with both seats attached and the fold with both seats is more compact than on Demi Grow with only one seat. The folded dimension of Demi Grow is 35”H x 23.5”W x 24″L vs Vista that is 17.3”L x 25.7”W x 33”H. -Car seat adapters. INCLUDED! It comes TWO infant car seat adapters for Nuna PIPA car seats. The adapters are the same for lower and upper positions so you don’t need to worry what goes where. BTW, Pipa is one of my favorite car seats. It’s worth mentioning that there is also a different so called ‘ring adapter’ that can be purchased separately. The difference is that the ring adapter is one piece and a little quicker to click into the frame. That’s all. You really don’t need to buy it. The included adapters work fine. -Travel system option. You can easily convert Demi Grow into a travel system by replacing the seat with a color matching Nuna PIPA car seat. You can also use it with Maxi Cosi car seats which are also very safe. 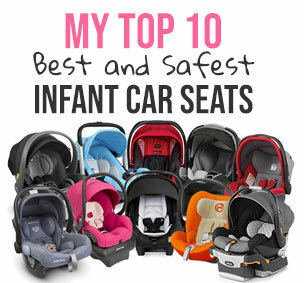 Here is my list of top 10 safest car seats. -Bassinet option. Love, love, love this bassinet! This bassinet is one of my favorite because it’s not only stylish, but also very practical. It easily connects to the Demi Grow frame without any adapters. Just like the handle bar and the bumper bar of the stroller, there is a vegan leather on top of the carry handle. The large UPF 50+ canopy with pop-out sunvisor and a ‘dream drape’ inside of the canopy provide your baby with complete sun protection. There is also a hidden mesh in the canopy that provides great air circulation. The small storage pocket at the end of the bassinet is very useful for smaller items. Soft mattress cover, top cover and zip-away liner are machine washable. When not needed the bassinet can be folded down flat and put away. You can use it as an extra sleeping places for your baby at home. -Infant car seats. The only thing I would like to see is ability to work with other car seat brands. Right now it works only with Pipa car seats and Maxi Cosi (but this one is not official). -Bulky fold. Fold is a little bulky and you have to remove the 2nd seat before folding it. -Bassinet not included. I am not saying it has to be included, but for that price it would be nice. -Heavy weight. Most double strollers weigh close to 30 lbs in a single mode and Demi Grow is not an exception weighing 28.5 lbs (with the seat, canopy, liner and bumper bar attached). Now, Vista on the other hand weighs only 26 lbs in a single mode with all the same stuff attached. I know you guys will be probably choosing between the two, so I decided to make a comparison table for you. While both models look very similar, there are a lot of small differences. And I think the main difference is that Vista comes with the bassinet while Demi Grow does not. The Nuna Demi Grow comes in three colors: caviar, frost, and aspen. You can get Nuna Demi Grow right now for around $799. It comes with rain cover, two car seat adapters, rear wheels covers, and a bumper bar. The great new is that there are bunch of accessories available for purchase. The second seat and the bassinet have to be purchased separately. Has anyone tried to fit the Nuna Demi Grow in a travel bag? Does anyone know any compatible branded bags. I’ve tried to reach online, but haven’t had any luck. So after a lot of research and in store testing I want to check out the nuna Demi grow. Is the handle to push the stroller circular? Or is it more of a rounded rectangular shape? I only ask because I really like the bugaboo Fox stroller, but when I tested it out the handle was super uncomfortable for me. Ive tried the uppa baby vista, joolz geo 2 and a few others. The nuna demi grow has a adjustable footrest which I think is really important to me. But I’m overseas and can’t find it in stores. I’m scared to purchase without knowing how easy it glides but more importantly how the handle feels in hand. Since I researched heavily and never seen a comment about the uncomfortable handle on the bugaboo fox, I was shocked and I’m hoping that it’s not the same with the nuna.